You have seen my Field Test Shooting video for the Shell Loading Umarex Colt Python BB Revolver but this time around I am testing out the less expensive lighter and higher capacity polymer version. 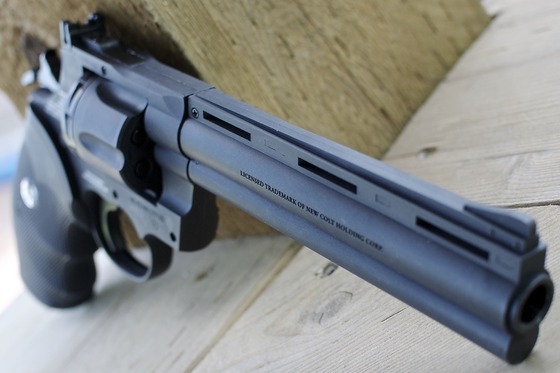 As per my typical Filed Test Shooting Reviews I shoot 5 rounds through my Chronograph for an average real world fps velocity and then I step back 30 feet and shoot 10 rounds at a paper target using a somewhat rested position for best results. In part one test of the Umarex Polymer Colt Python 357 CO2 BB Revolver, the Chronograph velocity test I managed to get 5 reading out of 10 shots (Chrony was acting up again) and averaged 426 fps using 5.1 grain zinc coated RWS BB's with a brand new 12 gram CO2. Perhaps my average would have been slightly higher if I got all 5 readings on the first 5 shots since the fps is always a bit higher. My highest reading was 442 fps while my lowest reading near the end was 406 fps. Part two, the accuracy component to this Shooting Field Test gave my fairly good results but perhaps not as good as the all Metal Shell Loading Umarex Colt Python I tested out earlier. I did find the Umarex Polymer Colt Python 357 CO2 BB Revolver shot well centered but got about a 2 inch grouping shooting 10 rounds on the paper target. If you find yours is not set to shoot exactly on the bulls eye you can easily adjust the sights for windage and elevation. 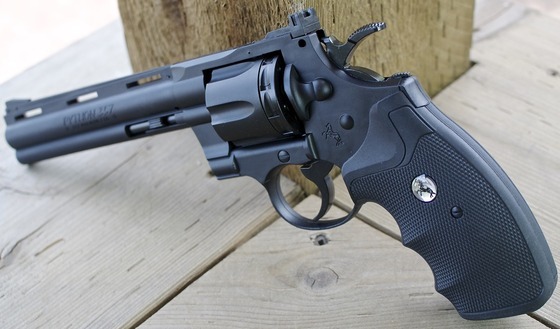 If you are wanting a higher than 6 round CO2 BB Revolver with a low price tag, good velocity, easy loading, adjustable sights, a smooth single and double action trigger and decent accuracy than checkout the Umarex Polymer Colt Python 357 CO2 BB Revolver!